Wonderful, wiggly Dendrobaena worms - busy turningour kitchen waste into black gold! Black gold - worm compost ready to go. Superfood for plants! Do you have worms? That is not a personal question you understand - but I mean actually in your garden? If you don't - then you may possibly have New Zealand Flatworm. I normally love worms but that's a worm that I really hate! I've had it in my garden for well about 15 years now. They look disgusting, a bit like an 'ironed-out' strip of liver, pointed at both ends, with a pink 'go faster' stripe along either side. They gobble up every earthworm in sight - with the resulting destruction of the soil drainage - because deep-tunneling earthworms are no longer there to do their vital job. Believe me - you learn to value your worms then! One of the reasons I make worm compost is to compensate for the fact that I no longer have enough worms working through my garden soil outside any more. They are vital to a healthy soil and their actions make plant foods more available to all the gazillions of soil bacteria, which act just like a digestive system in the 'gut' of the soil, making nutrients readily available for plant roots to absorb. It is a vitally important process. Without worms, their associated bacteria, and all the other billions of soil organisms such as mycorrhizal funghi - plant debris does not break down into what is known as humus. In fact - without worms globally - we would all be literally buried under millions of tons of unrotted plant debris lying around everywhere in a very short time. 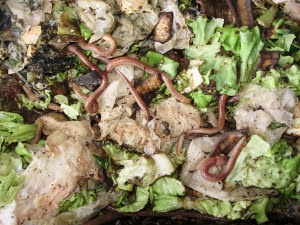 Without worms working in your garden soil and doing their part in Nature's perfectly balanced ecosystem, if you put any compost or a mulch onto the surface then it will just stay there in exactly the same state, instead of gradually disappearing as it should, as worms gradually pull it down under the surface. 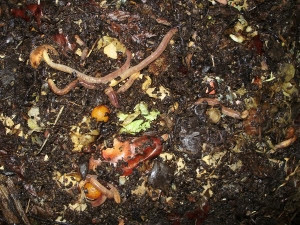 Years ago, when I was growing commercially, I used to make tons of worm compost in a huge bin made of pallets which was about 2m x 1m x 1m high. Sadly though, after I unwittingly imported New Zealand flatworms into the garden in some plants from a well-known Rhododendron nursery in the North (I am 100% certain), they then settled in and decided they liked the place - bred like wildfire and very quickly went through my worm bin for a short cut - followed by most of the garden too! I don't think I'll ever get rid of them entirely now - I've just learned to work around them. Interestingly enough, I had a long chat with the man at Finnis worms who sell worm bins and the worms to stock them - who said that masses of people all over Ireland are buying the earthworms he now also sells, specifically to replace those eaten by flatworms - interesting as I've only ever heard of one other place in Ireland that actually admits to having them at all! People seem somehow to be ashamed to admit it! Almost as if they have some deadly disease or think you can't be properly organic if you have them! Silly - as it's not your fault if you have them if you've introduced them unwittingly. It probably means that you like unusual plants like me and you can blame the 'globalisation' of the horticulture industry for importing them - and also the fact that we don't have Kiwis or any other Antipodean predators to eat them - even my chickens won't eat them! Yet another reason for avoiding those plants that come with a big carbon footprint! Flatworms also love organic gardens even more - because there's a lot more worms in them (before they get in there!). The only thing is - unless you get rid of the flatworm before you buy more worms to put outside in your garden - all you're doing is providing fast food take away for them because they're a siting target! Though I'm sure anyone selling earthworms won't tell you that!! I've been doing a lot of research and experiments on how to deal with New Zealand Flatworm. How how to avoid getting them in the first place, how to deal with their serious effects on your soil if you do and eventually restore your worm population, and I'll talk more about in another article. I bought one of those small 'high rise', stacking worm compost bins a few years ago and they do actually work very well for making small amounts. 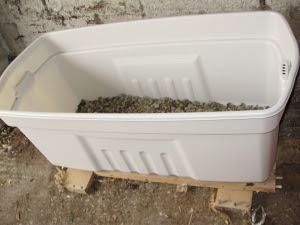 As they're really only suitable for small amounts of waste though, and as we try top be self-sufficient here and I needed a lot more worm compost. So I decided to make a slightly bigger, indoor system that I could put in the old stables so that it would be safe from any marauding flatworms. Those stacking bins are rather expensive too - all types being at least around €150 - so I looked around for a larger alternative. I found some big bench-sized storage bins with lids (on offer at the time in B&Q at 28 euros but available generally in most DIY shops). These were ideal, as they also had ventilation holes hidden in the handle wells. First I made drainage holes in the bottom at one end, by cutting off a couple of the extruded feet with a small hacksaw, then put the bin on a base of wood laths on a slight slope - with a small plastic tray under the drainage holes at the lower end to collect any run off - which makes a very good liquid feed. 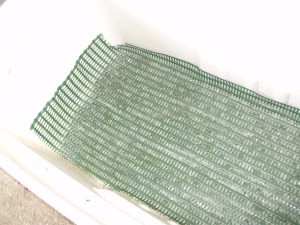 I then covered the base with gravel, covered that with some slotted plastic windbreak but anything similar would do, then put a double layer of ground cover material over that to stop any worms escaping - or broken down compost clogging the drainage. (Worms seem to be like sheep - hell bent on escaping at every possible opportunity - and believe me, all my birds would certainly appreciate them if they did - they wouldn't last too long!) 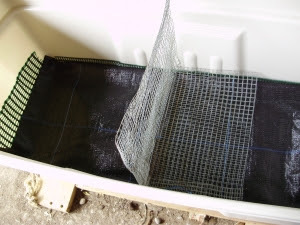 I then made a dividing mesh fence for the middle, so that I could put food waste into one half until that is full, then swap to using the other side, encouraging the worms to move to the new side by exposing them to light on the worked, 'full' up side. After setting the bin up, I made some nice soft bedding for the worms, from leaf mould and shredded damp newspaper, putting about 10cm of this to cover the bottom of the bin both sides - and it was all ready to receive it's new residents - 2 kilos of worms! When they arrived in the post, I put them gently into the bin, talked to them nicely, and covered them with a duvet of thoroughly damp newspaper to keep them moist. (They seem to like The Guardian best!) I gave them a couple of days to settle in and recover from 'post lag' and then started feeding them with a small amount of food at a time - after a few days they were eagerly racing through all the food. By the way - I couldn't believe at first that the leaflet from Finnis worms even actually recommended keeping the light on at night for a few days at first to help them settle in - I thought that was maybe taking anthropomorphism a little bit too far?!! But actually this is based on science - as worms naturally move away from the light, they are more likely to stay in the bin and not try to make a run for it and escape to go back home! Once they're happy and decide that they like you they will be too busy all the time chomping away on all the yummy goodies you provide, so they won't want to escape. 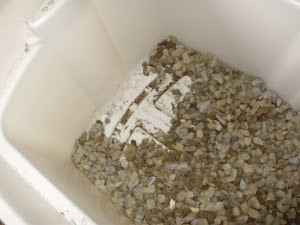 You can then take out the sweet-smelling, well-processed, worm-free material whenever you wish. It is a ready to go, rich source of soil microbes and plant micro-nutrients that can be added straight to soil when planting, scattered around plants as a tonic or made into an incredibly nutritious 'compost super-tea' in a large bucket or other container, by adding a small amount of the worm compost as a starter, then water and some molasses to feed all the microbes, stirring and fermenting for 24 hours, then watering onto the soil around plants. Worm compost is just like rocket fuel for plants - and the worms really are worth their weight in gold! My son caught me seemingly talking to myself in the old stable/potting shed some years ago (I do it all the time!) - and I explained I was talking to my new worm best friends - the Dendrobaena - which work through food waste much faster than the more usual red tiger worms. He raised his eyes to heaven and said "OMG Mum - your obituary will be entitled "The Woman Who Talked To Worms"! I replied that there could actually be worse things to talk to - anyway I love my worms - they are doing such a fantastic job and I was just telling them so!! Hey - I talk to plants, so what's wrong with worms? They react suddenly to loud noises, so why might they not respond to my positive and encouraging dulcet tones?!! I've had the Dendrobaena worms for a few years now - they are doing a fantastic job of processing our kitchen waste with relish. I got them mail order from Finnis worms in the North. Dendrobaena are in fact a type of earthworm, but not the 'deep tunnelling' type. They live in the top few centimetres of soil, processing plant wastes, a job at which they are the most efficient of all worms. Most municipal composting systems now use them exclusively. Their favourite food in the whole world is either carrot or sweet potato peelings - as they clearly have a sweet tooth! They're quite partial to a rotting avocado too if you get a bad one. They will even eat mouldy bread and left over pasta if you have any (without sauce! ), neither of which you can put onto the compost heap. Anyway - REMEMBER - LOVE AND RESPECT YOUR WORMS! They are your best friends! Don't kill them by using weedkillers, artificial fertilisers and pesticides which are death to all soil life - not only worms! A healthy living soil full of life is vital for our own health and also the health of everything else on the planet.